The PCO group was created in 2005. The original idea was to develop new areas of research, which were not present at LOA at the time: (i) the production of high-temporal contrast, high peak power few-optical-cycle pulses, (ii) the use of these pulses to drive relativistic-intensity laser-plasma interactions at high repetition rate (kHz) and (iii) the production of ultrafast secondary radiation from such interactions, such as high-brightness attosecond pulses and femtosecond electron bunches for applications. 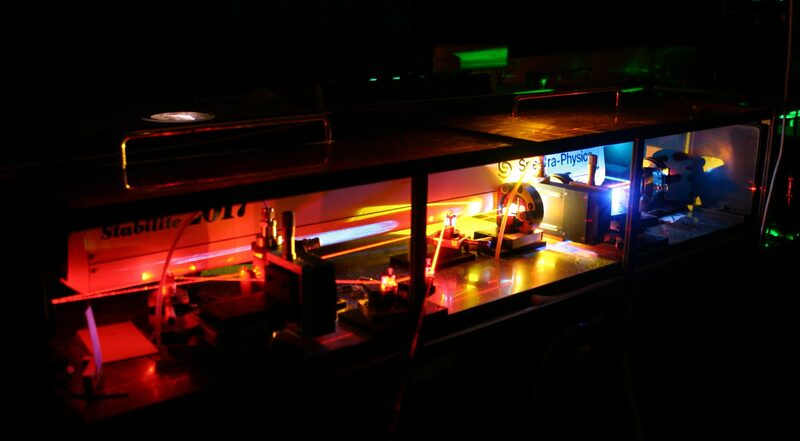 This was particularly relevant for bringing LOA back up to speed at the international level in the field of few-cycle laser development and attosecond science, which was taking off in many laboratories around the world at the time. The main impetus to this effort was given by the Chaire d’Excellence grant 2004 of Gérard Mourou, director of the LOA at the time. Today, the group has an internationally recognized activity on few-cycle laser developmentand relativistic plasma mirror interactions. Compared to other groups in the world, the specificity of PCO is that we drive attosecond pulse generation from relativistic plasma mirrors using tightly focused few-cycle pulses at high-repetition rate(kHz) with low energy (<10 mJ). Therefore, we are trying to scale attosecond pulse generation from plasma mirrors using compact kHz laser systems, better suited to applications downstream. The goal is to develop a source of intense attosecond pulses. Both aspects are important because they enable novel applications in attosecond science since high energy per pulse is a pre-requisite for performing real attosecond pump – attosecond probe experiments. 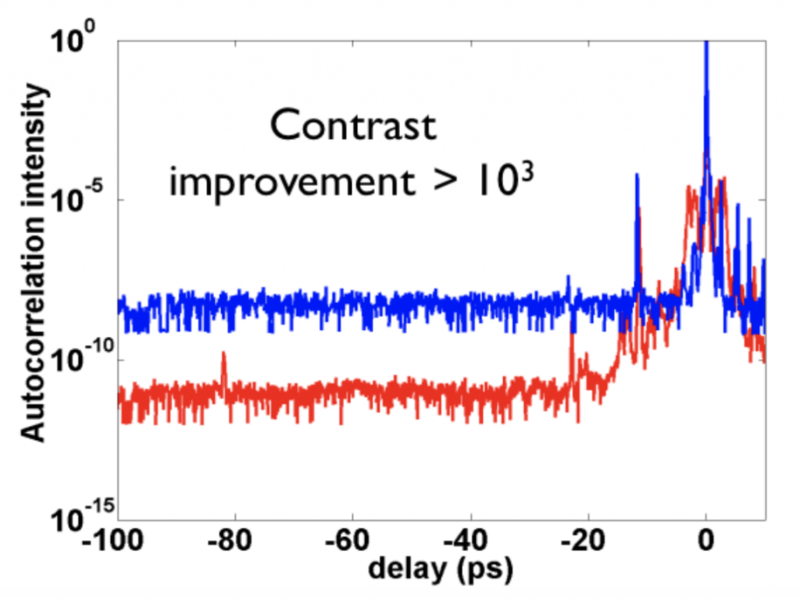 The success of such experiments relies almost exclusively on the spatiotemporal fidelity of the driving laser pulses: few-cycle duration, high temporal contrast and high focusability. 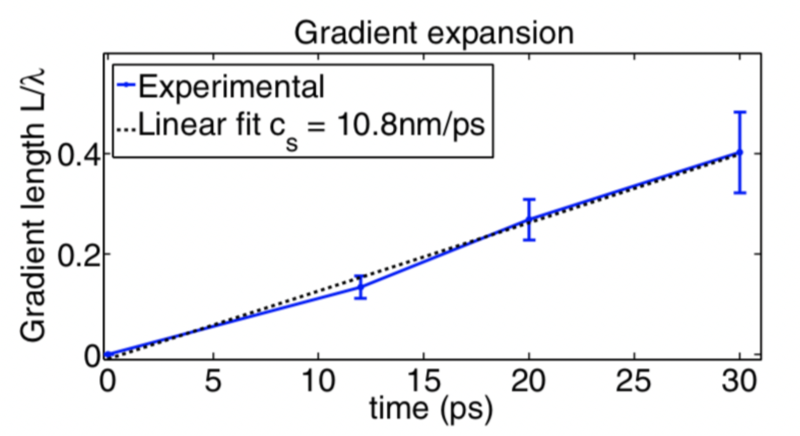 In this demanding context, the group also develops novel techniques to efficiently post-compress high-energy femtosecond pulses down to the near single-cycle regime with high spatiotemporal fidelity and to in order to deliver them with maximum intensity on target. During the period 2013-2018, the group has published 28 peer reviewed articles and 4 book chapters. They presented 21 invited talks, 52 oral presentations. There have been 1 scientific awards, 6 Ph.D. defenses, two habilitation defenses and 2 Patents. 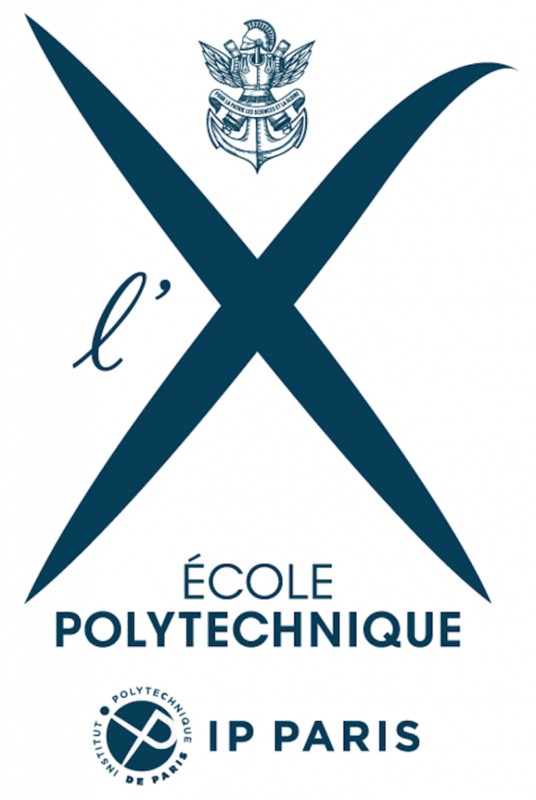 PCO’s success in the field was enabled not only by the in-house development of cutting-edge high-intensity few-cycle laser technology but also by the deep collaboration established from the outset with the group of Fabien Quéré from CEA Saclay, one of the pioneers in plasma mirror science. This has resulted in numerous collaborative projects funded throughout the years (e.g. ANR, ERC). In this last period, the deep collaboration established with the APPLI group, around the exploitation and continuing improvement of SN2, has led to the production of pioneering results. APPLI has brought their expertise in laser-plasma interactions, resulting in high-level publications on electron generation from plasma mirrors. This enjoyable and fruitful collaboration should continue in the future as it has been highly productive. At the national and international level, our activity on few-cycle laser development and kHz plasma mirrors is quite unique. We have obtained pioneering results that have attracted a lot of attention internationally, resulting in a lot of contributions to conferences and requests for technology transfer. Our deep collaboration with the spin-off SourceLAB should hopefully lead to the development of industrial-grade secondary sources for non-destructive testing, thus preparing for the deployment of laser-plasma technologies in industry. 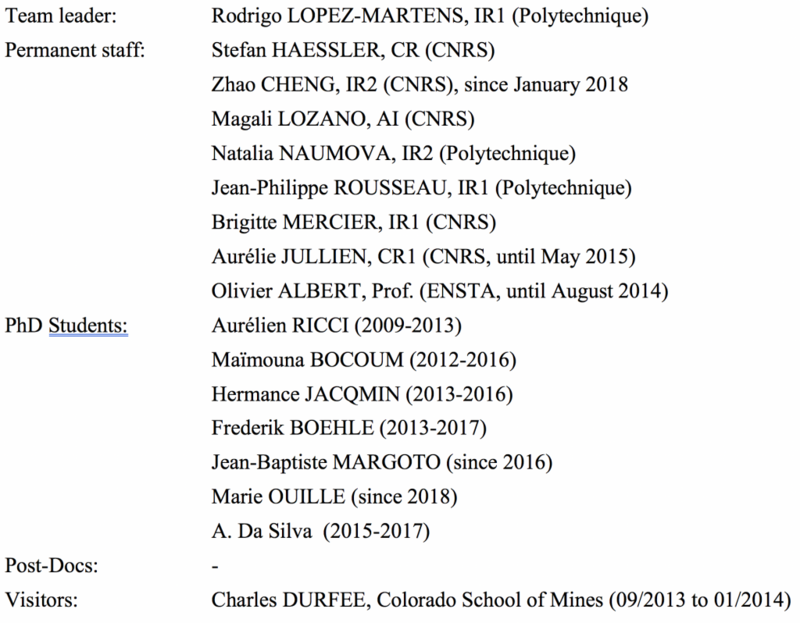 Other than the APPLI and Fabien Quéré’s groups, our main collaborators have been (i) Tamas Nagy’s group of MBI in Berlin for hollow-fiber compressor development (ii) Mikhail Kalashnikov’s group at ELI-ALPS for nonlinear pulse cleaning technology and (iii) the ITEOX company for developing spatiotemporal pulse diagnostics. Our ongoing involvement in the implementation of the future plasma-based attosecond beamline at ELI-ALPS should grant PCO priority beam time for plasma mirror experiments driven by unique laser parameters (SYLOS laser: 100mJ, 5fs, 1kHz, CEP) and hence the promise of priority beam time and pioneering results. 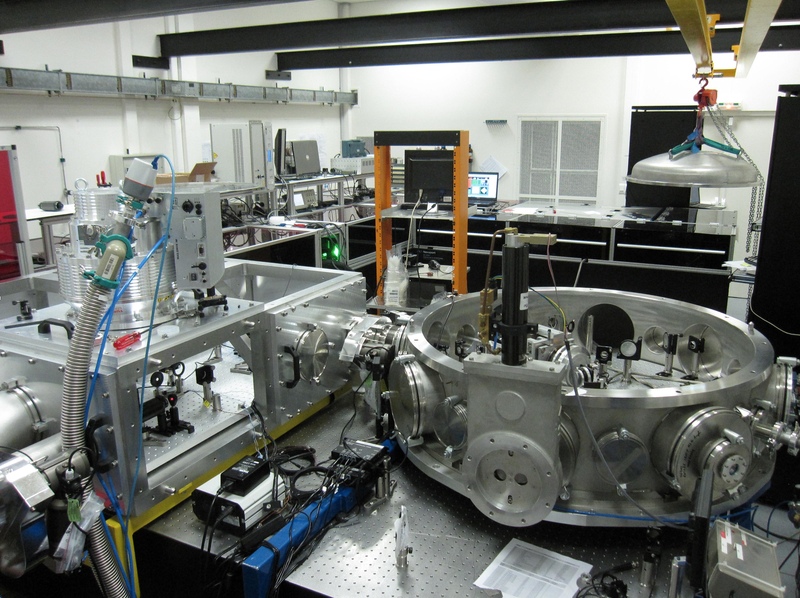 The SN2 laser system started operating with its current parameters (1TW, 1.5 cycle, 1kHz) in 2016. These unique parameters enabled APPLI and PCO to access the relativistic regime at kHz repetition rate, exemplified by the demonstration of relativistic electron acceleration. This leap forward in capability was rendered possible by integrating stretched hollow fiber technology for compressing our laser pulses down to the few-cycle regime at high energy. Schematic and picture of the stretched hollow-fiber compressor. The spectrally broadened pulses out of the 2.5m-long, 536m-diameter stretched fiber are temporally compressed using broadband chirped mirrors before being sent to the plasma mirror chamber. Pulse duration is measured in-line under vacuum using the dispersion-scan technique. The fiber assembly, spatiotemporal pulse shaping optics and diagnostics are directly integrated into the vacuum beamline. Power scaling of hollow-fiber compressors had been a huge barrier worldwide for many years until then. Stretching the fiber enables arbitrary scaling of fiber length and diameter with low transmission losses due to fiber bending. After an exclusive 3-year collaboration with the inventors of this technology (Tamas Nagy & Peter Simon from LaserLaboratorium Göttingen eV), we managed to produce TW peak power near single-cycle pulses: 3.5mJ, 3.5fs at 1kHz. Stretched fiber technology also enables the compressed pulse duration on target to be continuously tuned without energy loss and therefore to follow the transition into the relativistic few-cycle regime during the laser-plasma interaction. With the shortest pulses from the fiber (1.5 cycle at 750nm central wavelength), we can reach focused intensities on target in excess of 1019 W/cm2at 1kHz. 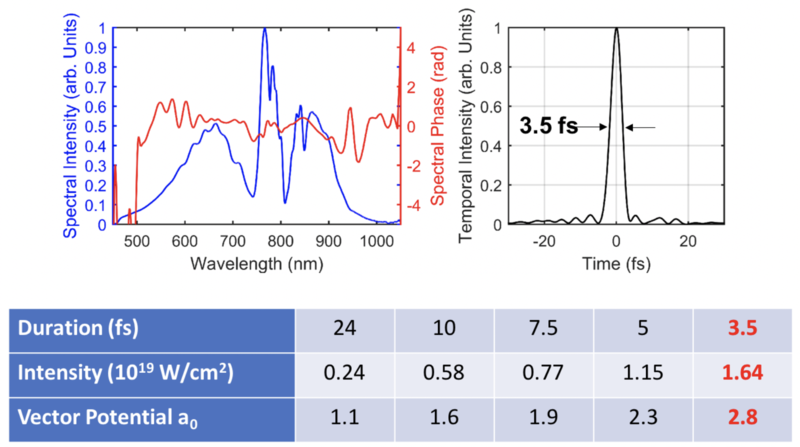 Spectrum and spectral phase and temporal intensity profile of the TW peak power 1.5-cycle pulses produced from the hollow-fiber compressor (top); Compressed pulse duration and peak intensity of the pulses delivered on the plasma mirror target. 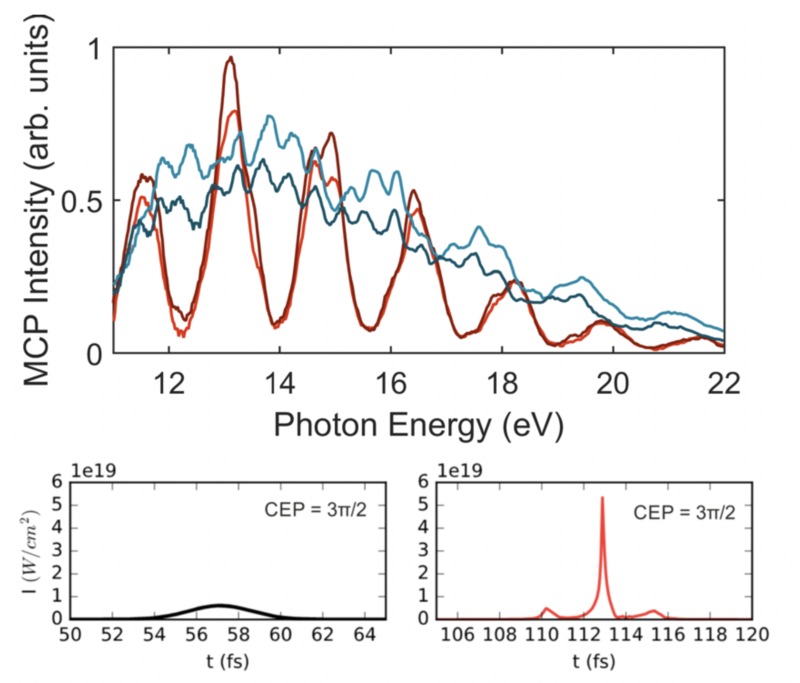 Another key feature of the few-cycle pulses delivered by SN2 is their high temporal contrast (> 1010up to a few ps before the pulse peak, see Fig. 3), directly inherited from the double-CPA architecture of the Ti:Sa amplifier. This high level of contrast is achieved thanks to an energy-scalable XPW-based nonlinear contrast cleaning device developed in collaboration with the Patrick Georges team at IOGS. 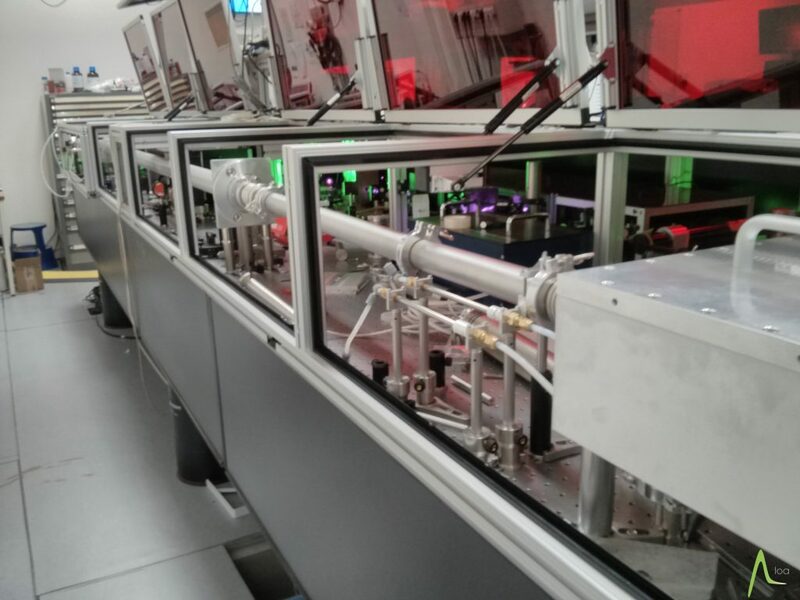 Because of its efficiency and reliability, this technology was also integrated into the high-contrast laser front-end of the APOLLON 10PW system under construction on the Plateau de Saclay. Temporal contrast improvement measured before (blue line) and after (red line) nonlinear XPW pulse cleaning in our double-CPA Ti:Sa laser system seeding the hollow-fiber compressor. The pulse contrast on target is > 1010 a few ps before the pulse peak, which is amply sufficient for reaching relativistic intensities without target pre-heating. Until recently, we had serious issues with CEP stability (> 500mrad RMS) due primarily to laser energy instability, which meant that most few-cycle plasma mirror results obtained during this last period were performed without CEP stabilization altogether. These issues have now been solved and we can routinely achieve record-high CEP stability (sub-200mrad RMS) thanks to the reduction of energy fluctuations out of the double-CPA seed laser to below % level and direct integration of the hollow-fiber compressor into our vacuum-integrated beamline. The upgrade of SN2 laser parameters in 2016 were a real game changer for our plasma mirror experiments. The combination of high pulse energy (3mJ on target) near single-cycle duration (1.5-cycle) and tight focusing (spot size < 2μm FWHM) made it possible to achieve on-target intensities well into the relativistic regime (a0> 2), which opens the door to the exploration of plasma mirror interactions with spatiotemporal intensity gradients almost limited by the laser wavelength itself. We knew that conducting plasma mirror experiments under such extreme conditions would not be feasible without accurate control over the interaction parameters such as pulse duration, spatial beam profile, plasma density gradient and CEP. For this we equipped our vacuum beamline with the maximum number of online diagnostics. Accurate knowledge of the electron density gradient at the surface of the target is the key factor of success in plasma mirror experiments. This meant using a weaker time-delayed pre-pulse to trigger plasma expansion before the arrival of the main high-intensity pulse. We developed a method for direct inline monitoring of both near-field and far-field beam profiles, which ensured highly reproducible interaction conditions from shot to shot. We also introduced a new spatial interferometry technique, called SDI (spatial domain interferometer), which enables us to measure the plasma expansion velocity directly on target as a function of pump-probe delay. 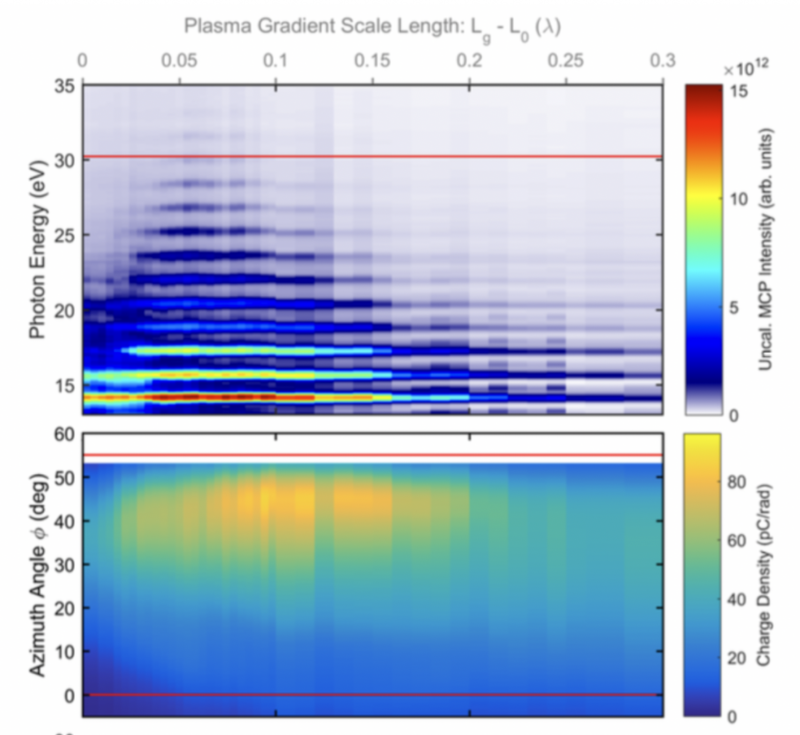 This method yields plasma gradient values that are in excellent agreement with those retrieved by conventional FDI (Fourier Domain Interferometry), which is far more difficult to implement. 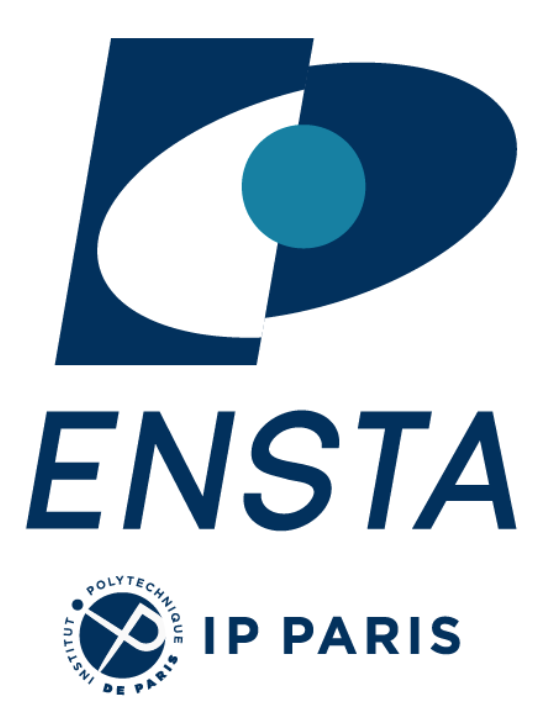 Due to its simplicity and reliability, this in-situ measurement technique has now spread to other labs working on plasma mirrors, such as CEA Saclay. Measured relative plasma expansion velocity for a pre-pulse intensity of 3.5 x 1014 W/cm2as a function of pump-probe delay. The retrieved plasma expansion velocity is in good agreement with FDI measurements performed under similar conditions. Our high degree of control over the interaction parameters enabled us to perform plasma mirror experiments under hitherto unexplored conditions. Our ability to simultaneously detect photon and electron emission from the plasma mirror enabled us to unequivocally demonstrate the correlated emission of harmonics and electrons at optimal gradient lengths around ~ λ/10 (where λ is the central laser wavelength), as predicted by the relativistic oscillating mirror model but never observed before experimentally (see the case for 9fs). The results obtained for in the near single-cycle regime (3.5fs) were rather unexpected and extremely exciting results in the context of early predictions made about highly efficient attosecond pulse generation from relativistic oscillating plasma mirrors. Despite the absence of CEP stabilization, time-stamped monitoring of the laser CEP drift and harmonic emission gave us a first glimpse at potentially beneficial CEP effects in generation process. Indeed, single-shot harmonic spectra clearly show the production of quasi-continuum-like spectra, corresponding to the emission of a single, isolated attosecond pulse for specific values of the CEP. 2D PIC simulations clearly show that for there exists a range of optimal CEP values, for which the relativistic oscillating plasma surface can temporally compress the most intense the cycle of the driving laser field and produce a TW peak power few-100as pulse containing up to 30% of the driving laser energy. Single-shot harmonic spectra recorded for 3.5fs laser pulses (I ~1.6 x 1019 W/cm2, a0~2.7) relative CEP offset of ~π (top). For certain CEP values, we observe a spectral quasi-continuum corresponding to the emission of an isolated attosecond pulse in time. This is confirmed by 2D PICsimulations (M. Thévenet, LBNL) that reveal a highly nonlinear plasma-driven compression mechanism of the driving light field into an intense attosecond pulse with a with a π periodicity in CEP (bottom).